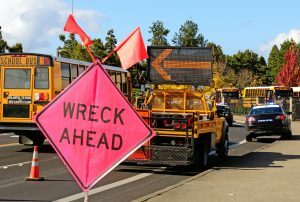 Earlier this month, a fatal accident occurred when a school bus allegedly attempted an illegal u-turn on Interstate 80 in Mount Olive, New Jersey. The bus, driven by Paramus Board of Education employee Hudy Muldrow Sr., 77, was carrying 44 passengers as part of a school trip. Tragically, two of the passengers, teacher Jennifer Williamson, 51, and an unnamed student of ten years of age were killed as a result of the accident. Muldrow is now facing two counts of vehicular homicide, also known as “death by auto”. While these charges will be decided on in criminal court, whether or not any kind of civil personal injury lawsuit will be filed is yet to be answered. The first type of claim that might be filed in this case is that of a wrongful death claim. Wrongful death claims in New Jersey are filed with the purpose of seeking recovery for specific types of damages when a family member is killed by the reckless or negligent actions of another person or party(s). However, unlike personal injury claims, wrongful death claims can not recover punitive damages or pain and suffering damages. Of course, if you are considering filing a wrongful death claim on behalf of a deceased family member, it is highly recommended that you first consult with an experienced Parsippany wrongful death attorney so that you can better understand your rights and options, and navigate the entire claims process in an effective, informed, and ultimately successful manner. While this bus and truck accident did result in the tragic deaths of two different people, many others were also injured when the bus was struck from behind by a dump truck. Depending on the extent of the injuries suffered, these individuals may wish to consider filing a personal injury claim in order to recover compensation for their medical expenses, lost income if they are unable to work, and the physical and emotional pain and suffering they experienced due to the accident and resulting injuries. However, as with any personal injury claim, some act or acts of recklessness or negligence must be proven in order to secure personal injury compensation. In this case, several key factors could potentially be considered negligence. According to reports, the bus driver missed his exit, and then attempted to correct for this by making an illegal U-turn through the mediation reserved only for emergency vehicles. If proven true, such an act of negligent driving could potential result in a successful personal injury claim against the driver and his insurance provider. Apparently, driver Muldrow has also received a total of 8 speeding tickets, and has had his license suspended 14 different times from 1975 to present. With this kind of driving record, a case could potentially be made that he was hired negligently by his employer. An experienced negligent driving injury attorney may be able to make the case that any entity who is employing individuals to drive others should never hire a person with such a driving record, and that doing so was an act of negligence in-and-of-itself. Again, due to the stringent requirements for proving negligence, proving the full extent of the injuries and damages suffered, and ultimately recovering full and fair compensation in any personal injury case, retaining the counsel of an experienced injury lawyer is highly recommended any time you are seeking compensation for your injuries and accident-related damages. At The Law Offices of Michael P. Burakoff, we have extensive experience helping our clients and their families to recover full and fair compensation in wrongful death and personal injury claims of all kinds in towns across Morris County and Sussex County, including Parsippany, Netcong, Morristown, Newton, Dover, Mount Olive, Denville, Hopatcong, Morris Plains, Hanover, and the surrounding communities. Attorney Michael Burakoff has a unique approach to personal injury law in that he strongly believes in not only keeping his clients highly informed throughout the process, but also involving their family as well. This is because he understands that any kind of serious injury will affect the whole family, and not just the injury victim themselves. By providing informative, inclusive, and highly effective legal counsel, Michael Burakoff aims to lessen the stress involved with the accident/recovery process, and ensure that your family’s future is protected and secure. To speak with Michael Burakoff and our legal team today in a free and confidential consultation regarding any kind of accident you or a family member has suffered, your options for securing personal injury or wrongful death compensation, and how exactly we can help you and your family to do so, please contact us online, or through either our Morristown office or our Newton office at (973) 520-0525.